The Devour makes its US debut - UK soon? The new Moto Devour - get it over to the UK quick sticks! 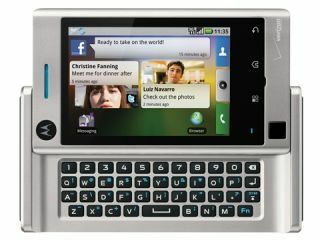 Motorola has released another Android-toting mobile phone, the Devour, with its fancy overlay. The new Devour takes a few cues from the Milestone in terms of design, with an industrial-looking chassis holding a touchscreen and a QWERTY keyboard. There's an 8GB memory card in the box, and the display is a (small-ish) 3.1-inch capacitive effort. There's a 3MP camera on board, Wi-Fi and a headphone socket - all specs which point it towards the lower end of the price spectrum. However, it's only rocking Android 1.6 - no, we're not sure why either, but we hope it changes before it gets to the UK. The MotoBlur overlay is a welcome addition too - it means you can synchronise your Twitter, Facebook and MySpace feeds with contacts and have them displayed in one easy to read widget on the home screen. However the bad news is this has only been released for the US at the moment, with no European release date in sight at the moment. We'll be heading on down to Motorola towers and rooting through the bins later, so if we find any discarded tissues that look like they have any prospective release dates on, we'll snap them and let you know.